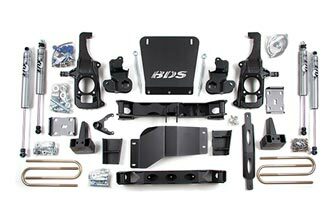 BDS Suspension adds to its lineup of 2019 kit listings with lift kits and accessories now available for the 2019 Chevy and GMC 2500HD and 3500HD trucks. 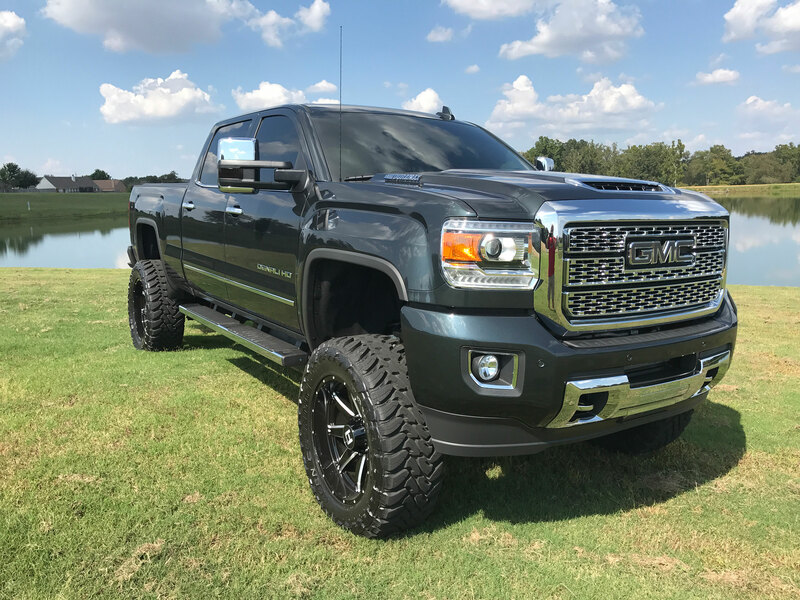 All kits carry over from the 2011-2018 Chevy/GMC HD applications and have been test fit and confirmed compatible with the 2019 model HD trucks. 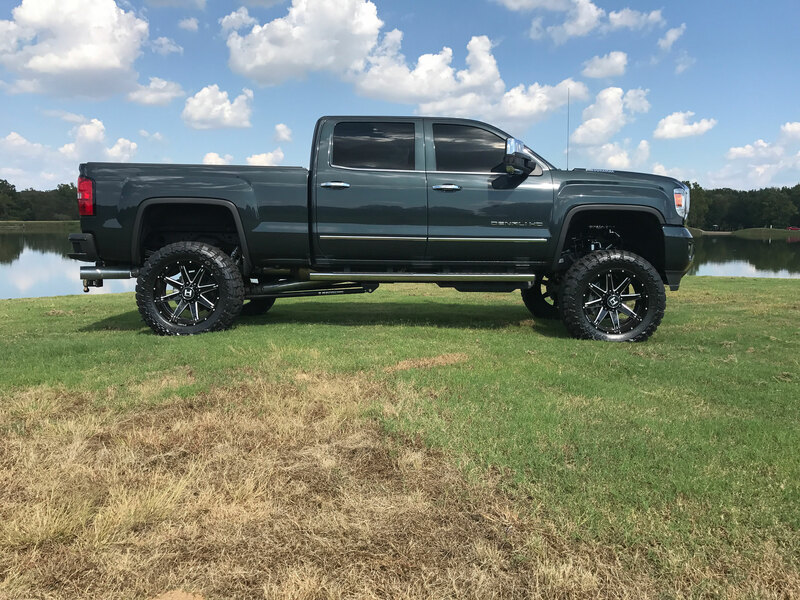 Whether you're looking for a stout 4.5" & 6.5" high clearance suspension systems or 2.5" & 6.5" coilover conversion systems to eliminate your factory torsion bars, BDS has a lift system to meet your performance needs. As with all BDS lift kits, these kits are backed by Factory Protection Plus for peace of mind wherever your adventures may take you. Factory Protection Plus includes BDS’s exclusive No Fine Print Warranty along with a 5-year, 100,000-mile drivetrain warranty. 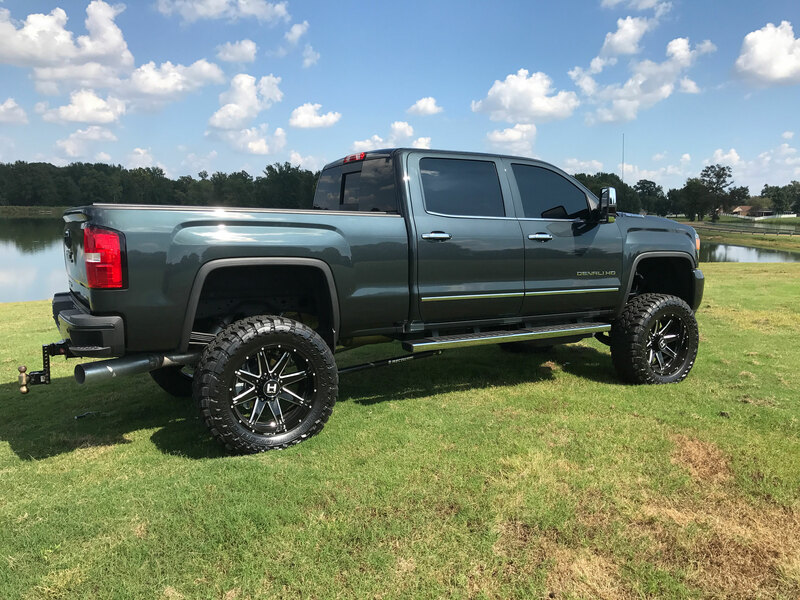 Improve the performance, capability, and curb appeal of the new 2019 Chevy Silverado HD or GMC Sierra/Denali HD with BDS Suspension. 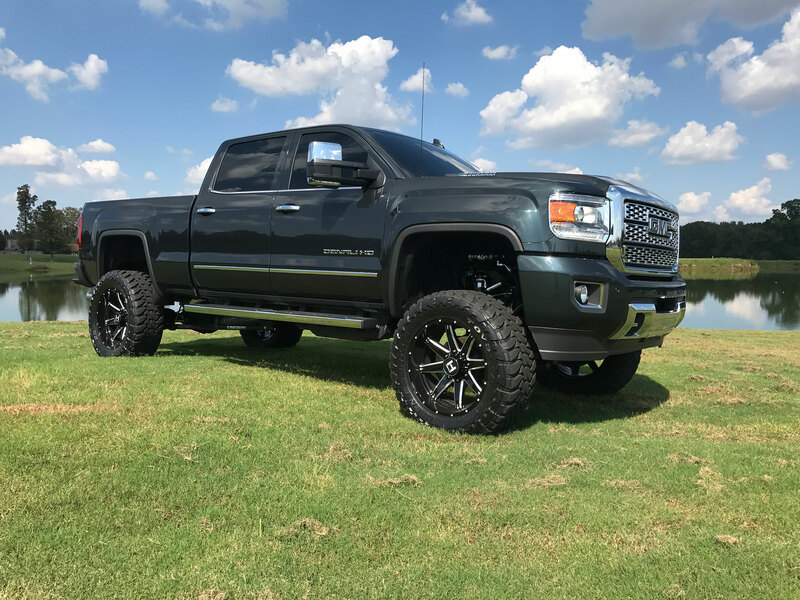 2.5" Coilover Conversion Systems: BDS offers game changing performance with this 2.5" coilover conversion system for the late model HD trucks. Designed to eliminate the factory torsion bars and convert over to FOX 2.5 factory series coilovers with DSC adjustment, this system offers unmatched high speed performance, on-off road ride quality, and capability. Along with the coilovers these systems include heavy duty upper and lower control arms to allow for 30% increase in front suspension travel. The upper arms are built from heavy wall 1.5" OD tubing with durometer specific rubber bushings and MOOG ball joints. The lowers are BDS heavy duty replacements, full boxed and internally gusseted. These arms use rubber frame mount rubber bushings and heavy duty ball joints for long life and easy maintenance. Also included are bolt in upper coilover frame mount and weld-in support gussets, differential drop spacers, longer sway bar links, rear FOX shocks and a 2" fabricated block kit. This system comes pretuned for 2.5" of lift for optimal compression/droop travel, but ride height can be adjusted between 2-3" of lift by adjusting coilover preload. This kit comfortably fits 34" tires, 35" tires with some trimming. 4.5" High Clearance IFS System: BDS has built a reputation for quality GM suspension options with their high clearance IFS systems. 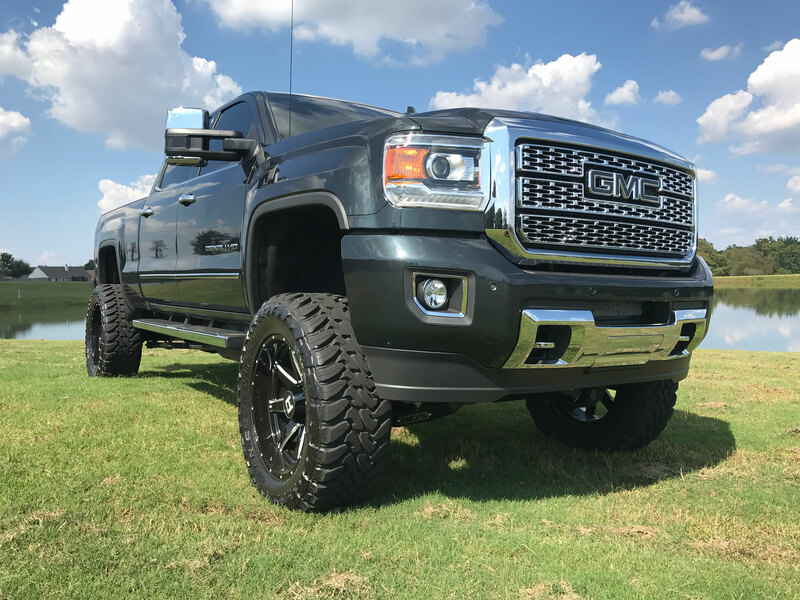 Designed to improve performance, capability and ground clearance while maintaining ride quality, the 4.5" High Clearance IFS Systems are great option for customers looking for a stout lift kit to comfortable fit 35" tires. 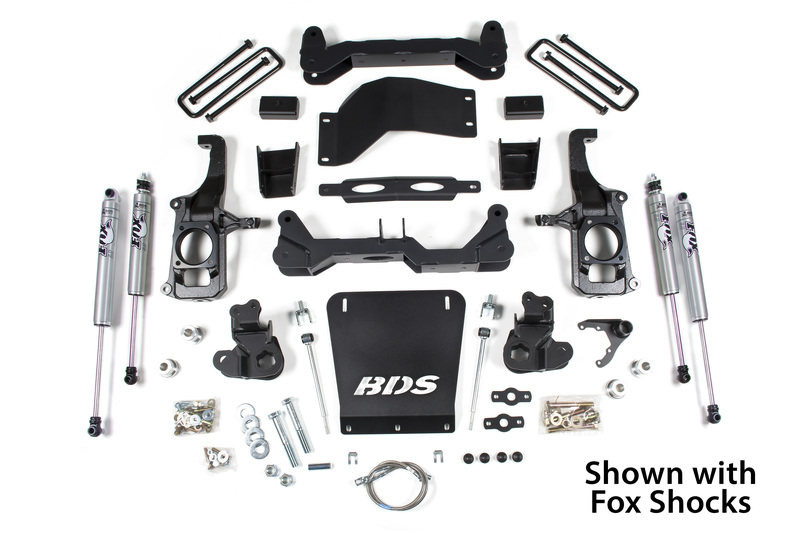 These kits integrate flawlessly with the OE installed electronic stability control (ESC) systems for safety and use a pair of one-piece 1/4" steel high clearance crossmembers, differential relocation brackets, heavy duty differential skid plate, support brace, and front BDS-branded skid plate to create a sturdy subframe and improved offroad protection. A pair of CNC-machined ductile iron steering knuckles dwarf the factory units and position off the stock upper arm and relocated lower arm mounts without increasing track width. To further increase the ground clearance over other kits this 4.5" system tucks the torsion bars up tight to the chassis using a pair of torsion bar relocation brackets that key off the factory lower A-arm. This design maximizes break over ground clearance to keep from getting high centered offroad with the added benefit of providing a clean, streamline appearance without the torsion bars hanging down. Extended DOT compliant braided stainless steel brake lines are supplied to all full suspension travel, longer links to allow the sway bar to function properly and your choice of precision tuned BDS NX2-series or FOX 2.0 IFP performance gas shocks at all 4 corners. 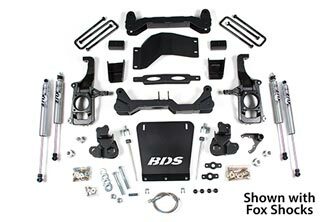 In the rear, this kit is offered with either a 2" or 3" rear block and u-bolt kits to achieve your designed stance. 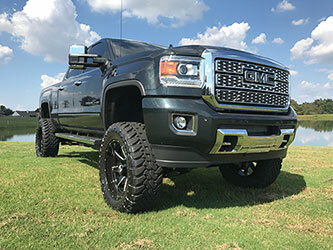 6.5" High Clearance IFS System: Built off the tried and true BDS High Clearance design, these 6.5" IFS systems carry off many of the same features as the 4.5" lifts offering improved performance and capability while retaining on-road comfort. The 6.5" lift systems utilize heavy duty 1/4" steel, laser cut crossmembers, multipoint differential relocation brackets, heavy duty steering knuckles and differential and front skid plate creating a sturdy subframe and corrected suspension geometry. 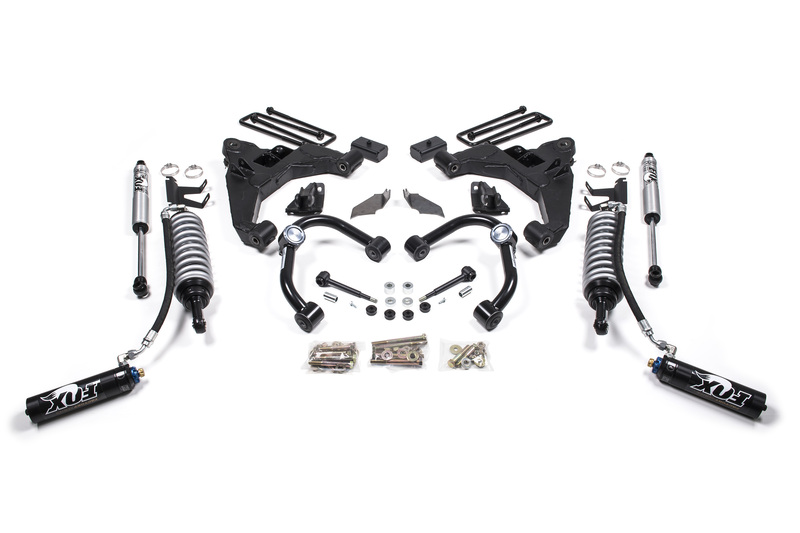 To further increase the ground clearance over other kits this 6.5" system tucks the torsion bars up tight to the chassis using a pair of torsion bar relocation brackets that key off the factory lower A-arm. This design maximizes break over ground clearance to keep from getting high centered offroad with the added benefit of providing a clean, streamline appearance without the torsion bars hanging down. Finishing out these kits are extended sway bar links, stainless steel braided DOT compliant brake lines and your choice of BDS NX2 gas shocks or FOX 2.0 performance IFP gas shocks at all 4 corners. 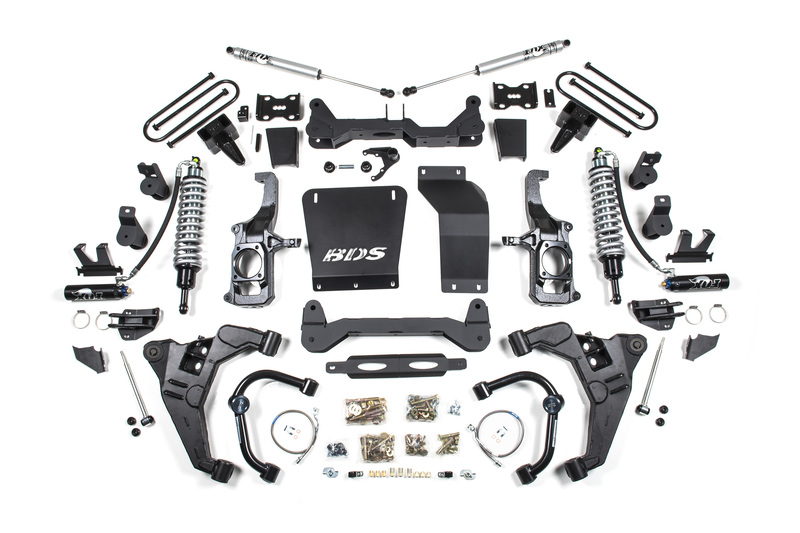 In the rear, this kit is offered with either a 3" standard block kit or 5" block u-bolt flip kit to achieve your designed stance with room for up to 37" tires to be installed. 6.5" Coilover Conversion High Clearance System: Built to maximize the potential of your late model HD, these new 6.5" coilover systems bring together the strength and reliability of the BDS high clearance IFS systems with the unmatched performance and tunability of the FOX coilover conversion for the late model HDs. These systems have all the increase ground clearance, improve suspension travel, allow clearance for 37" tires, allow for easy ride quality tuning (using DSC adjuster) on road comfort, and offroad capability. At the heart of these systems are a set of pretuned FOX 2.5 factory series remote reservoir DSC (dual speed compression) adjustable coilovers, heavy duty upper control arms, BDS high clearance crossmembers, internally gusseted lower control arms, multipoint differential relocation brackets and skid plates, extended brake lines, bump stops and sway bar links, upper coilover mounting brackets, ductile iron steering knuckles, rear lift blocks and rear FOX 2.0 shocks. Designed and tested, these system offer unmatched performance for your late model HD across any terrain. RECOIL Traction Bars: The problem with most traction bars is the fixed length design doesn't follow the arc of the suspension. While they may limit axle wrap, they bind up the suspension to the point the rear suspension it ride horrible. BDS solved this issue with the RECOIL traction bar system. Spring loaded with a full-floating design, these bars are designed to improve traction and limit axle wrap while allowing suspension travel and maintain on-road ride quality. 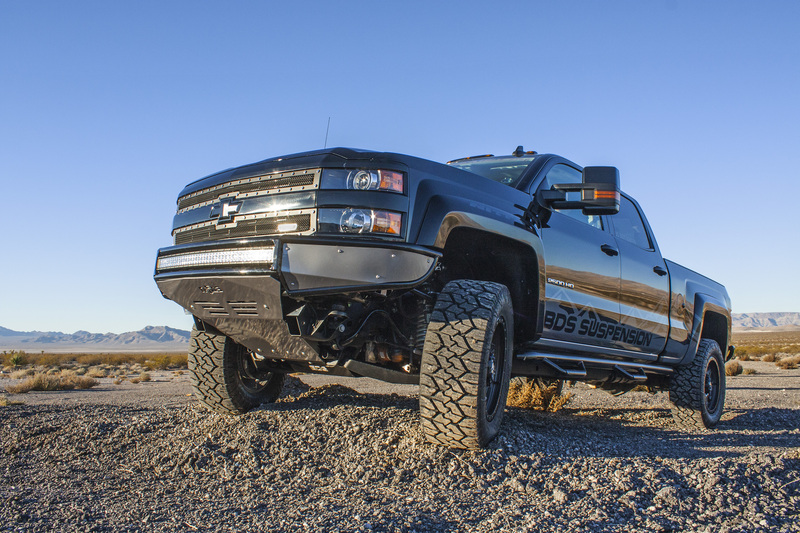 BDS RECOIL traction bars offer you the freedom to tune the spring compression for optimal performance on-road, off-road, towing, or competition pulling. 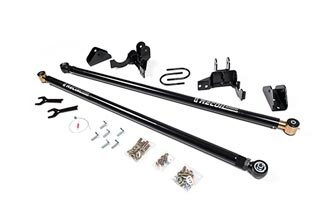 These traction bars can be used on stock height or lifted trucks and work with both lift blocks and replacement leaf spring kits. The bars are built from 2" OD x 3/16" wall steel tubing with a forged flex joint at one end and on the other a full floating end a 3000lb spring rated internal compression spring. This spring can be preloaded using the supplied spanner wrenches to "tune" the stiffness of the traction bar to meet your needs. Vehicle specific mounting brackets make installation a breeze. I just found your blog and was reading through the available lifts. I have a 2019 GMC 2500 Denali HD much like the one pictured on this bulletin. This is exactly the look I’m going for. Can you please tell me what size lift, what size tires and what size rims those are? Thank you in advance. I ordered your 4.5 hc kit for my 2015 2500hd denali. Going with 35 12.50 tires. My question is on the rim. I want 20×10 with as much neg as this kit will allow without major fender work. I do not mind minor trimming to . I have spaced the front bumper also 3/4 inch already . The main thing will be the back side. I want as neg as possible rims I like on this set up is gonna take atleast neg 19 on 10 wide for the look id like. Will I have to get into nor cal?? I see 35s can be run with factory rims however no info as to rims. I really didnt want to go to 6.5 . Im asking once all ordered parts are in what should I expect here?? Thanks for reaching out. Ultimately I don’t have an exact answer for you on the fitment side. There are a number of factors that play into tire clearance and we don’t test every wheel/tire combination on there. Things like the actual tire measurements, aggressiveness of the tire sidewall lugs, how the vehicle is used (on or off-road), heavy aftermarket accessories like winch bumpers and bed caps, accessories like fender flares-mud flaps-nerf steps that effect wheelwell clearance, and your comfort level trimming fenders all play into the tire clearance topic, our max wheel/tire recommendations are just that, recommendations, based on what we’ve tested in house and confirmed compatible. Other wheel/tire specs can be used, however additional modification may be necessary.